Flanders Pre Pleat 40 LPD extended surface pleated filters are designed to operate in most types of installation. These filters have an average atmospheric dust spot efficiency range of 25-30% per ASHRAE Standard 52.1 test methods. These filters offer greater efficiency and service life than disposable filters, pad and frame systems, or metal washable filters. Operating face velocity ranges are from 0 to 500 fpm for 2" filters. 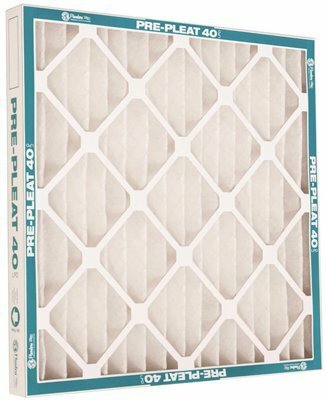 Pre Pleat 40 filters are UL 900 Class 2 listed. MERV 8. If you have any questions about this product by Flanders, contact us by completing and submitting the form below. If you are looking for a specif part number, please include it with your message.